When I found out I needed an hysterectomy I was extremely shocked and terrified. I had been to my GP on another rather trivial matter when it came to light I had huge fibroids attached to both ovaries and they had combined to become the size of a football. At this point I had no pain but had been dieting and could not understand why the weight was not going from the front of me. I looked pregnant but thought it was just fat. People have the operation for all kinds of reasons but it is always difficult both because of the procedure itself and the very real sense of loss. Waking up after the operation I remembered the ward sister telling me about how awful I would feel afterwards and how much better I would feel in a couple of days. I was aware of someone putting my oxygen mask back on as I tried to pull it off. Throughout a few hours someone kept putting a cuff on my arm to test my blood pressure. When I had my out patient appointment the surgeon had sent me to the sister for a full explanation of everything that would happen, before, during and after the operation. He informed me that she would be able to tell me exactly what everything would feel like, having the operation herself.I was also shown round the ward and measured for my surgical stockings. I think it was around the point she described the blood thinning injections I started feeling the room beginning to spin and asked for water. It was fortunate that everything happened so quickly for me, giving me much less time to scare myself. The thought of tubes and injections in the hospital and generally loss of control sent shivers down my spine. I knew the operation itself carried only a small risk as there have been so many improvements over the years. The thought of hardly being able to lift anything was not welcome. I was lucky that my husband was not at work at that time and I would not have the problem of arranging suitable childcare at such short notice. The night before I was admitted I went to see Legally Blonde at the cinema with the Guides. This was an extremely good film so helped considerably to keep my mind occupied. I also wanted to help take the Guides out that night as I would be missing for a few weeks. 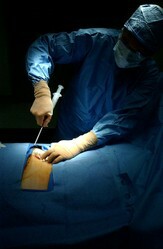 I was admitted in the afternoon before the operation, now people go in on the day of the operation which is an improvement. Woken and told to take a bath, waiting to see when it was time to go to theatre I became increasingly anxious so much so that I greeted the anaesthetist with 'I want something to calm me down' A kindly lady in a floor length blue silk outfit gave me three tablets and checked the size of my surgical stockings. She explained that I must move about, doing ankle circles to start with following the operation, everything must be done to prevent blood clots. Gradually I became calmer and by the time I saw the lady in her surgical gown and had a needle put in the back of my hand I was very relaxed indeed. In no time at all I was waking up, trying to remove my oxygen mask and being reminded how to use the Morphine pump. I lost over a stone in weight during the operation, together with a lot of blood so had to take iron tablets for three months. Going home was a relief but it took quite some time to recover and I found it quite boring sitting around so much. I felt weak and breathless after walking very short distances. It was soon to attend my younger daughter's Carol concert at school so I increased the amount I could walk each day so I could walk as far as the Church for the day, I just made it. When I finished recovering and commenced all my usual activities I realised I was feeling much stronger than before the operation. I did go on supportive websites a few times but having already completed my family I had less issues than some, they did help. Recommended website- support discussion -www.HysterSisters.com This helped me to read about and discuss issues with others while remaining completely anonymous. People on the site know first hand about the feeling of loss, the feelings of being ,less female' and tips about how to feel better. Hospitals also offer support groups for people who are able to discuss these matters in person. It was not an easy time but no-where near as difficult as it used to be and the operation has a good safety record. I too was terrified when I came to know that I have to undergo hysterectomy after trying out hormone pills for quite some time. It was inevitable but fortunately, I recovered fast without any complications. That might be because I did not have any fibroids.